Tonight I went to a really wonderful event called “Breaking the Fast: a Glittering Arts Showcase of Rad Muslim Voices”. I went to support a couple of my rad, poet friends who were performing. It was indeed, as the event description promised, “a night of fabulous performances, comedy, poetry, music and much more by glittering, rad, talented Muslims.” And glittering it was. It was quite something to see such a diverse crowd drawn from all walks of life seeking to better understand a culture and faith that has been so deeply misunderstood on many levels. I learned incredibly much and left feeling inspired about our ability to collectively lift the weight of oppression — be it ethnic, religious, colonial, gender-based, environmental, or otherwise. Among the crowd was the lovely Lydia — my stranger of the day. She’s really good friends and now basically family with a couple of the event organizers. She was bubbling with positive energy and warmth from the moment I met her. 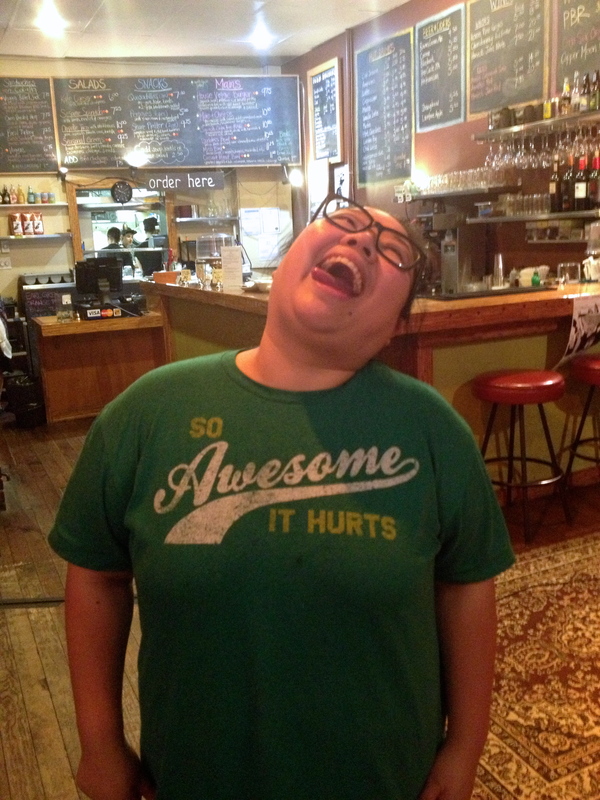 It’s true — I was inflicted with immense amounts of pain by her awesomeness. Lydia has worked as a youth worker for queer youth. The work that she’s done there has been extremely valuable and necessary on so many levels. But it was especially significant to her because when she was younger and navigating this world as a queer individual herself, she sought and found the support she needed from that same group. It has been a great experience for her giving back to that very same community. It has come full circle. Right now is an exciting time for her, as she’s about to move in with her partner of 4 years. She could not be more excited. I asked her about what it was like growing up as a queer individual in such a heteronormative society (so heteronormative, I contend, that the word itself is underlined in red as I type). She told me about how on some level, she always knew she was queer. “The girls at school would say ‘look at that cute boy’ but I would think ‘well, what about that pretty girl? '” She wondered how something so deeply real to her could be so easily and thoroughly disregarded, shamed, and ignored by others. Lydia is frustrated by the exclusion of marginalized communities in our societies. If we let these groups of people have more sway in our every day, she explained, then we would be much further as a society at large. If we gave more weight to youth voices, queer voices, women’s voices, and oppressed voices in general, then the world would be a better place than it is today. And let me tell you: Lydia is working toward paving the path to this reality. I’m very inspired by Lydia’s passion, positivity, and story. I feel very grateful to have met her today.